VARIDESK will Change the Way You Work! This height-adjustable desk sits on top of your existing desk and allows you to work comfortably from either a sitting or standing position. If you like the two-tier design, but need to fit multiple monitors or extra hardware on your desktop, you'll want the Pro Plus 48. The two-tiered design with separate keyboard/mouse deck gives you plenty of room for basics and accessories with the added convenience of never having to move any components when raising or lowering your VARIDESK. Like all VARIDESK models, the Pro Plus 48 features our patented, spring-assisted lift mechanism that allows you to raise and lower it almost effortlessly in just seconds. It can hold up to 45 lbs. (20 kgs.). It comes fully assembled and ready to use - just place it on top of your desk and you're ready to work! 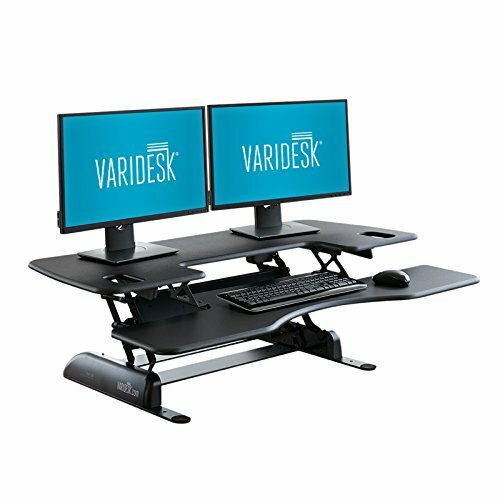 Improve your health, energy and productivity with VARIDESK! Comes fully assembled right out of the box - no assembly, installation, or tools required! If you have any questions about this product by VARIDESK, contact us by completing and submitting the form below. If you are looking for a specif part number, please include it with your message.